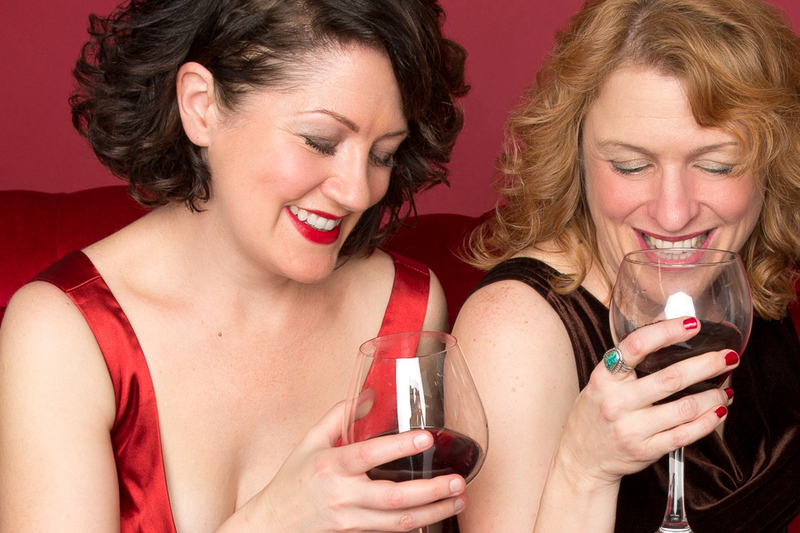 Shanan Custer and Carolyn Pool have created another great showcase for their considerable acting, comedy, and writing talents in Sometimes There’s Wine, and they’ve clearly found a great co-conspirator in director Anya Kremenetsky. The whole show hums right along from one sequence to the next, with Eric Webster’s skillful sound design as further humorous glue tying the thing together. There’s a lot of moving parts to Sometimes There’s Wine, so stage manager Morgan Lavandowska must have quite the pre-show checklist in place so that everything gets laid out just right and Custer and Pool can sail from one scene straight into another. I was embarrassingly late to the party in regard to Custer and Pool’s first two woman Fringe tour de force 2 Sugars, Room For Cream. (I could be forgiven for a little of that, since the show was so popular in its first run it was damn hard to find a ticket. And rightly so.) When I finally got to see it, I quickly realized that I’d been harboring a lot of ridiculous preconceived notions about it. My brain foolishly thinking labels like “comedy” and “women” somehow meant this show was destined to be just fluff, or not something a guy could enjoy. Far from it. In fact 2 Sugars, Room For Cream, and now Sometimes There’s Wine, are exactly the kind of shows I’ve been longing to be entertained by. Then I miss ‘em when they’re sitting right in front of me. Not making that mistake again. Custer, Pool and company get packed houses, repeat productions and awards for good reason - they make great theater. Sometimes There’s Wine follows the 2 Sugars, Room for Cream template (if it ain’t broke, don’t fix it) - multiple scenes, quickly sketched characters that become fully realized people. The key ingredient this time is alcohol instead of caffeine. And just like caffeine, alcohol isn’t always these women’s best friend. But sometimes it very much is. The way it’s a friend for the audience is in the way it loosens the tongues of these various characters and gets them talking. Custer and Pool are a few years on from their 2009 Fringe hit, so are many of their characters, and their concerns. But they also play much younger (down to elementary school age, even). Key phrases, bits of information, jokes, or character relationships loosely tie the evening together in a way that tweaks your brain just enough to make you realize you probably should be paying closer attention. This is one of those plays where I’m scribbling madly because every other line is so smart and funny I want to share it. You can be laughing so hard you miss the next joke. Custer and Pool are so great at playing off one another that a lot of the evening feels improvisational, or just like actual conversation between two people, rather than two actors trading funny lines with each other. The trickiness of relationships between family and friends is a common thread. These are the people you can say anything to, and about, whether you really should or not, and they’ll (probably) still love you anyway. Wedding receptions, dinners alone, doctor appointments, family holiday meals, waiting in airports - getting through life isn’t always a picnic, but the people you love, even a stranger’s friendly listening ear, and a little wine, can help make it easier. You should just go see Sometimes There’s Wine for yourself. It’s almost impossible to summarize, but it’s a treat to experience in person. Theater this good shouldn’t be taken for granted. Go.